Anyhoo…yes…beets! Delicious roasted beets! A few weeks back, we went to the local farmer’s market and picked up a bunch of autumn squash. We also picked up some fresh fingerling potatoes, fresh herbs including dill and beets in a variety of colours. I’ve been saving the red beets and fresh dill, so I could try my hand at making a delicious, simple roasted beet borscht. A lot of borscht recipes use beef stock as a base. I wanted to make a vegetarian borscht that had just as much flavour as its meat-based counterpart – and one that was easy to throw together on a week night. Some borscht recipes suggest adding chopped hard boiled eggs, shredded carrots & cabbage, or cooked potatoes. However, the borscht I ended up putting together was very simple – it highlighted the flavour of slow roasted beets and fresh dill. A touch of red wine vinegar cut some of the sweetness of the beets and the vegetable stock made the borscht a bit more savoury. And a dollop of sour cream added some richness and creaminess that I loved. 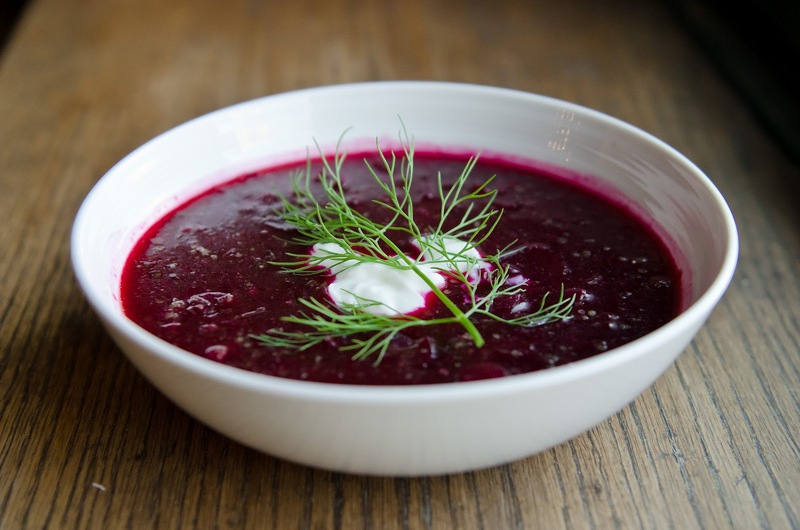 This simple vegetarian borscht recipe is a keeper for sure! Hope you are all having a wonderful week! :) I’ll be back in a few days with my countdown to Canadian Thanksgiving – which is a week and a half away. Since Thanksgiving is one of my very favourite holidays, I have a lot of recipes planned and cannot wait to share them with you! 1. Preheat oven to 375’F. Place roasted beets in a large roasting pan. Drizzle with 2 tablespoons of oil and a good sprinkle of salt and pepper. Toss to distribute the oil well. Roast the beets, turning once or twice during roasting, for 40 minutes (or until a thin-bladed knife pierces a piece of beet with little resistance). When the roasted beets are cool enough to handle, chop them as finely as possible. 2. Put the remaining 2 tablespoons of oil in a deep skillet or medium saucepan and heat over medium-high heat. Add the diced onion and cook until soft (about 3 minutes). Turn down heat to medium-low and continue cooking the onions until golden and very tender (10 to 15 minutes). 3. Add the beets, along with the stems of the dill (tied together in a bundle with kitchen twine) and broth to cover (about 6 cups). Turn the heat back up to medium-high and bring the soup to a boil. Reduce heat to medium-low, cover and cook, stirring occasionally, until the soup is well coloured and beets are starting to melt away (about 10 minutes). 4. Add the red wine vinegar and season with salt and pepper. Note: you can add a bit more vinegar if you find the soup to be too sweet. 5. Remove the dill stems from the soup. Chop the remaining dill (the fronds). Sprinkle the fresh dill fronds into the borscht reserving some for garnish. Serve with a dollop of sour cream and garnish with dill. Enjoy! Oh My Gosh. That looks amazing! I adore soups, especially borscht, so I can’t wait to try this. P.S. I hope your hands have returned to their original colour! oh lady, i’m a huge fan of the office ;) this borscht looks DELISH! i can’t believe some people put chopped egg in it. that makes me want to vomit. I just had my first full bowl of borscht the other week and loved it! The version I tried had potatoes and cabbage in it and I liked the heartiness that the potatoes added, but I like the idea of letting the flavour of the beets shine through! Excited for your Thanksgiving posts – I haven’t even though about it yet, I need to get on that! this borscht looks incredibly delicious! love it! Uh yum! That picture is gorgeous! I’ve never had borscht and I’m starting to think I need some! Have a great week! So pretty! I have never made borscht before – a job well done for your first time around!! and YES I LOVE the Office – hahaha that was an awesome episode jim as dwight – epic! This is the first time I made borsch and we enjoyed this recipe. Roasting the beets made the borscht taste delicious! It was nice this recipe called for everything I had in my kitchen. I have referred this recipe to five people so far and they are all going to make it. Thank you! My grandmother used to make borscht when I was growing up. I have been searching for years to find a recipe like hers- I think this is the winner. Thank-you so so much! Awe, I am so thrilled to hear that! :) Thank you for the lovely comment.